Andrea Reynosa, left, president of The Solution Project stands in front of the Narrowsburg School with husband Kevin Vertrees, member of the committee. 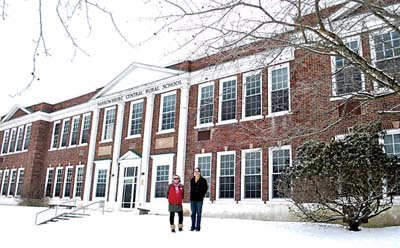 NARROWSBURG  January 14, 2014  The Narrowsburg School, standing empty ever since 2005, could become a major contributor to sustainable economic growth in Sullivan County area if a local grassroots organization has its way. The Solution Project (TSP) has joined with the National Resources Defense Council (NRDC) in looking to expand its current focus on food production in the Mid-Hudson Valley area, explained President Andrea Reynosa and Vice President Jennifer Grossman. Narrowsburg School Adaptive Reuse Project or NSARP is proposing to take the existing school building, and to convert it not only to a food hub for local famers including facilities for meat and dairy aging and packaging, but also to a college-level satellite campus with SUNY Sullivan in Loch Sheldrake. Grossman who is a part-time consultant with NRDC and full time Livingston Manor resident and a farm owner, sat down to talk to the Democrat about why Narrowsburg and the school are such a good fit for a regional food hub. How is this different from the other food processing initiatives taking place in the county? She also added the space could be rented to restaurants or caterers who are committed to bringing local food to their customers both locally and in the city to prepare their food. Grossman continued, “Education  the school has classrooms, we’ve already talked to SUNY Sullivan. They love the idea of being the author of the Food Hub Logistics Program, first ever in New York State  how it can become certified. This could be their satellite campus where we train all their food hub students. Grossman said she was hoping for the funding to be in place by the end of the summer. He added if the grant money becomes available, the building would be used for other courses as well, although the curriculum focus around supporting agriculture with food hub is consistent with what the college is doing, so there’s an opportunity to work together. The grant is worth $12 million. “If the grant won’t come through we would still support agriculture and food hub related courses,” added Mitchell. • Commercial kitchen for rental for food processing and packaging. • Meat and dairy aging and processing for value added produce like salami and cheese to allow farms to be commercially viable. • Food hub management to fill the gap that can create local resilience in the food system. • Distribution network in place. • Education, classes; possible satellite campus for SUNY Sullivan.